Varicose veins are a common problem these days. 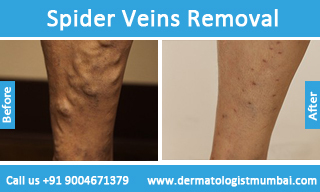 Spider veins are equally common. A large number of people look for remedies related to these problems. However, before one looks into remedies, one ought to look into the cause of the problem. When veins turn large or are swollen or go through a twist or turn, then varicose veins or spider veins occur. The major difference between spider veins and varicose veins is the size. While spider veins are smaller, varicose veins are extremely large. 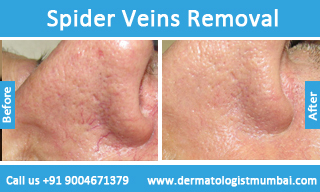 Telangiectasias, commonly known as Spider veins, are usually tiny dilated blood vessels beneath the skin surface and calibrating between 0.5 & 1 millimeter in their dimension. They might take place wherever on the body, nevertheless are normally observed around the nasal area, cheeks & chin. They may also appear on the lower limbs exclusively on the top of the legs, usually just below the knee joint in addition to throughout the ankles. 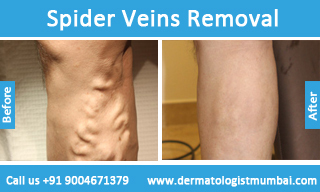 Numerous factors can be attributed to varicose veins and spider veins. Problems can occur when the valves inside the blood vessels behave faulty. If someone has previously suffered from blood clots, then also this could be a problem. Abdominal problems, tumours and at times, even clothes and accessories lead to complications. Whatever the cause may be, varicose veins are very risky and ought to be done away with as soon as possible. It has often been found that more women tend to require varicose vein treatment as compared to men. More often than not, the problem occurs in old age. Approximately 30% of the adult population suffers from this problem. Treatment of varicose veins (Spider Veins Removal) is best done by a varicose vein specialist surgeon and treatment involves laser, sclerotherapy, surgery and lifestyle modification. 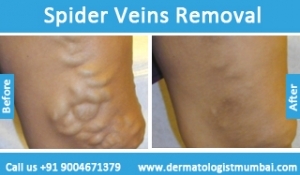 A lot of people neglect the need for spider vein treatment. The gold standard treatment for this condition is sclerotherapy. Laser treatment (Long pulsed Nd YAG, Pulse dye laser) is also available. What is the Sclerotherapy treatment procedure? 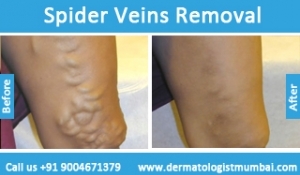 Sclerotherapy is the procedure of delivering medicine into the cavity of the affected blood vessels. These types of medications lead to inflammation involving the blood vessel resulting in occlusion. A very fine needle is employed in the procedure requiring a few minutes. A single spider vein may take 1-3 injections for permanent obliteration. 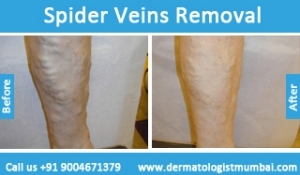 Spider Veins Treatment with Sclerotherapy can treat 10-20 vessels in a single procedure. The patient is advised to be active and avoid sitting or standing still for long periods, but vigorous activity has to be avoided for the next two days. The injected vessels might disappear instantly or after a few days. Relapses can occasionally occur due to development of parallel blood vessels. Leakage of sclerosant on normal skin can cause swelling, irritation, allergies etc. At The Esthetic Clinic, Quality patient care is provided through well trained specialist Dermatologist – Dr. Rinky Kapoor as well as plastic surgeon, who give customized expert advice and personally perform treatments with the latest technology and techniques in treating any disease/cosmetic concern available world over.